Lose weight, regain your energy and health with 30-minute recipes and practical, step-by-step advice. Other cool products and services that we LOVE!!! These are my absolute favorite low-carb recipes books from Tasteaholics. I recommend them for anyone but especially if you are new to low-carb and ketogenic cooking. Make them in 5 EASY STEPS. These books make it so easy to try new recipes without being complicated. They are my kind of recipes!! I’m super excited about the new Keto Weight Loss Meal Plans that my favorite low-carb site, Tasteaholics has launched!! They will send pre-calculated, low carb meal plans and recipes right into your inbox – no more hunting down recipes on the internet and trying to fit them together perfectly every day. Right now they are offering a 7 Day FREE Trial so if this is something that you’re interested in, it’s a great chance to try it out and see if it’s for you. I am a big fan of meal plan services but they need to suit you and the types of food you like to eat, so definitely sign up for the free trial. For as little as $7.49 per month, you can forget about worrying what to eat. It’s a great price when you consider how much mental time that frees up for you, as well as how easy it makes staying on track with your diet. If you’re keen to try the FREE 7 day trial and find out more, click the link below or the image! 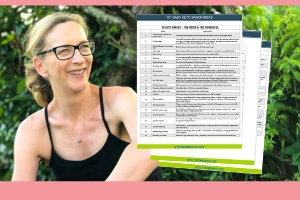 I am a big fan of Leanne Vogel at Healthfulpursuit.com and I love the meal plan programs that she has created. Balanced Keto Weekly Meal Plans eliminates the time-consuming stress and preparation necessary to successfully follow a low-carb, high-fat (keto) diet. Each weekly plan is delivered straight to your email. Follow the latest proven, tested and real-world applied research of high-fat, low-carb eating with these planned meals, pre-made shopping lists, and invaluable tips to keep you on track. Stop struggling to decide what to eat, when to eat and how to eat it and start living fat fueled! Sign up for the free sample meal plan to help you decide if the program is right for you. I love using my secret weapon, exogenous ketones for getting back into ketosis quickly and avoiding any keto flu side effects. I’ve used these products before but they have never had a great taste. Perfect Keto though, is a brand which is no carb, additive free and comes in awesome flavors like chocolate sea salt. Exogenous ketones are a supplement used for boosting performance and energy, or complementing a low carb diet designed for weight loss. They are ketones you can consume that your body isn’t directly making. However from your cell’s perspective, they cannot tell the difference. When you’ve been eating more carbs intentionally. It’ll have you back in fat burning mode in no time. I like to have some on hand, especially during the holiday season when I do like to be more relaxed about food. Perfect Keto Base Exogenous Ketones, comes in Chocolate Sea Salt, Coffee, Vanilla and Peaches and Cream. You can add the powder to smoothies, water, coconut milk, almond milk, coffee, shakes, or any low or no-carb drink. At the moment I am enjoying the Exogenous Ketone Base in Chocolate Sea Salt. I add a scoop to a glass of almond milk, then add a dash of mint flavor. It gives it a delicious chocolate peppermint flavor….yum! It boosts me into ketosis and fat burning mode and also turns hunger off! It’s a great tool for weight loss and energy. I also love and use the MCT oil powder daily. I use it in bulletproof coffee and stirred into greek yogurt.